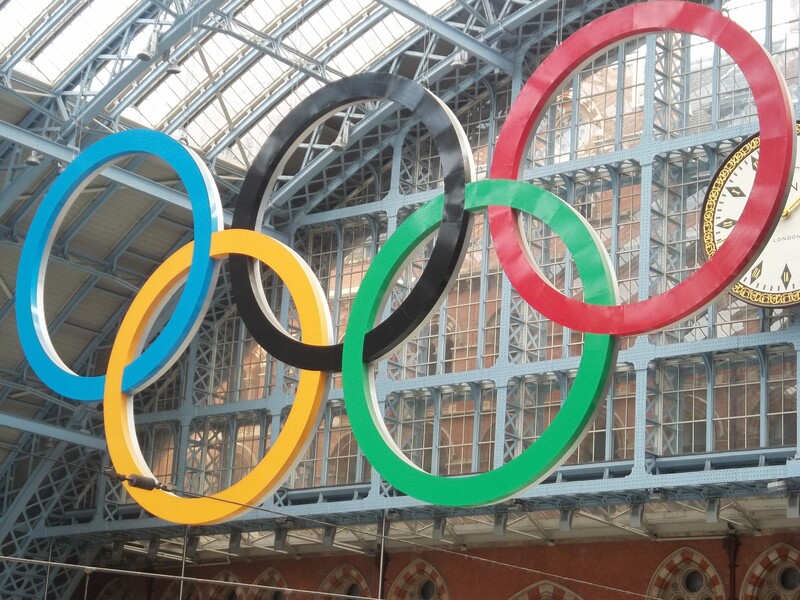 St. Pancras Station, London, Aug 8. Remember the Olympics, that quadrennial competition between the world’s elite corporate sponsors? McDonald’s-by-the-Thames, Lebron and Kobe on the same team, scandal on the badminton court, wholesome sublimated paint-ball nationalism (you know, my guy ran faster than your guy, especially if you live in Jamaica) and all that? It was in all the papers. In any case, it seemed to me that the topical concern of a previous post (August 24) – namely, the modal incidence of August-born baseball players in the major leagues – could be naturally transposed to the Olympic context. Does birth month in any way broaden or constrict an athlete’s (Summer) Olympic prospects, or is the correlation spurious, or scant? But before we put the lens to the data, you recall that the August birth-month skew among ballplayers is typically ascribed to the July 31 birthday cut-off for kids enrolling in any given year’s Little League cohort. That closing date makes the August-born oldest in their admitting class, so to speak, and thus bigger stronger, more adroit in the baseball arts, and thus possessive of a sustained developmental edge. In this regard, and you may have missed it, reader James Zhang’s September 9 comment thumb-tacked to the baseball birth-month post asks a most salient, purloined-letter of a question: what if the August birth-month differential could be more properly laid not to Little League registration policies, but rather to the simple demographic possibility that more children are born in August? The baseball numbers aren’t enormous (averaging about 168 players per year), but the aggregate effect is pretty evident, particularly when keyed to the 8.48% “chance”-driven expectation for August births. The conclusion then is multivariate: both national and ballplayer August births better chance likelihoods, but it is the baseball effect that pulls farther away from default expectations. In any case, a birth-month tug does seem to be in force here, something to be kept in mind. But what then about the Olympics and its vastly more heterodox, Little League-less athlete pool? What sort of birth-month association, if any, marks the data? Before we broach our question – whether a birth-month effect in any way correlates with Olympic medal success – a few words about the workbook’s design would be instructive. 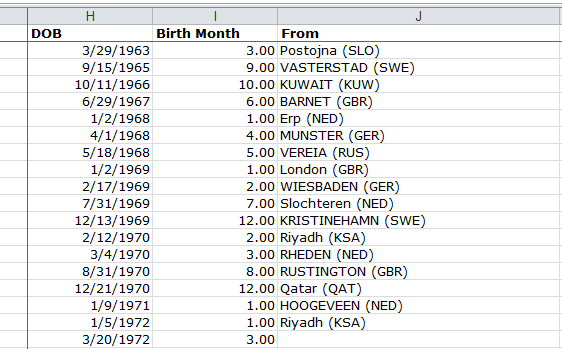 Note the coupling of first and last athlete names in column A – not the by-the-book way of handling such data, particularly if you need to sort these by last name. That task can be dealt with even as the data stand, but the task can get messy. On the other hand of course, the names are extraneous to our purposes right now – but maybe not next time. =(TODAY()-H2)/365.25 (the denominator represents the average number of days per year). Moreover the Age Group field, impressed into Row Label service in Pivot Table 10, comprises text data, and as such cannot be further manipulated absent a concerted round of hoop-jumping. If in fact you want to group the athletes by age tranches you’re far better advised to substitute the Age field and dice the data with the Pivot Table’s Group Selection option. By sounding an unrelieved drone of YESes in its cells, the Medal Winner? field consigns itself to dispensability, teach us nothing. By definition, the workbook means to catalogue none other than medal winners. On the other hand of course, if you have no plans either to use these data or present the field to readers you can merely ignore it. Note the G, S, and B fields (Gold, Silver, and Bronze) and their fractional medal representations, the Guardian’s attempt to align overall country medal totals with the grand total of actual athlete medallists, an obeisance to team-based competitions. Thus Croatia’s Valent Sinkovic in A932 comes away with .25 of a silver medal, having competed in the Men’s Quadruple Sculls Rowing event. These apportionments do make a certain sense, but other analytical necessities may bid you to award him one, indivisible silver. will return the value 9 (September) for Ms. Shin. Once in place, we can copy that expression down a column, and we’re done – maybe. Don’t you just love error messages? I can’t explain why these text entries infiltrated the larger complement of workable dates but they did, and to dangle a preposition, it’s something we need to deal with. 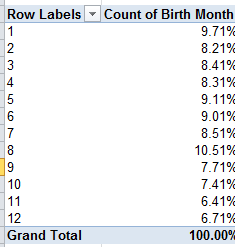 Before we break out birth months we need to see to it that all our data-to-be in fact qualify as months. One possibility: we could sort the DOB column by Oldest to Newest and eye the bottom of the record stack. I see 21 text-formatted, faux-date entries; and while we could return to the insert-a-blank-row-above-these-records expedient (something I’ve explained in earlier posts, including August 30), thus estranging the bad apples from the usable data (they only contribute about 2% of all records, after all), we don’t have to. The reality is that we can retrieve the months from these date pretenders, and here’s how I’d to it. is invariably soldered to an IF statement, and inspects the referenced cell for its data type. If the cell comprises text, one thing happens; if it’s other than text (e.g., a number), something else happens. In our case we stipulate that if the cell evinces a text content, Excel will proceed to extract the month from the cell via the nested MID function (how that happens will be detailed in a moment); if the entry is not text, that is a number, then the formula will apply MONTH to the cell’s date/number. Declares how many characters will be appropriated from that inception point. in A8, I should realize the character sequence READ. Thus for our text-date data, those data to which we want to direct MID, we see that the month segment of text-bearing cells always situates itself in characters 4 and 5 – a good thing, because had single-digit months (January through September) been conveyed in single-digit terms (9 instead of 09) we’d have had to wrap our hands around a much stickier wicket; we’d have to have written a formula that sometimes extracts 1, and sometimes extracts 2, month characters. (Note also that the text-date cells are expressed in European date format, in which day of month precedes month, even as the other data appear in American, month-first style). would realize the value 7, had you entered a text-formatted 7 in the cell. 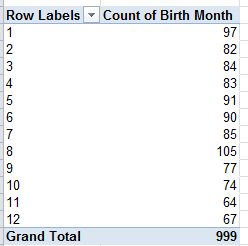 Drag the Birth Month field to the Row Labels area. I’ll take a wild guess and allow that the largest birth month happens to be…August, the only one stepping up to three figures. Note in addition the no-less-striking, precipitous fall-off in the succeeding months. August rules – again – but of course a satisfactory accounting awaits. Now there is some evidence for a global August birth predominance, but a closer look is clearly in order. 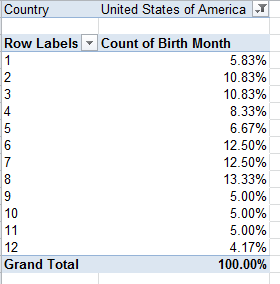 A UN international, country-by-country birth-month spreadsheet (click the small download link, but there’s some hoop-jumping required here in order to whip the data into shape) shows a July-September birth skew, but you’d have to toil to reconcile Olympic countries and team size with these data. Still another win for August, albeit for a relatively small universe. Another remarkable stat: filter for People’s Republic of China and you’ll behold a 23.68% birth contribution from January (athlete total: 76), an extraordinary outlier I’ll leave to the Sinologists. Sure there are other pivot table permutations to be crunched (you could break out for gender, for example, and sport), but the principal research remit is already out there: tracking and explaining the birth-month curve. An artifact of fertility trends, or the consequence of subtle, worldwide athlete recruitment protocols – or a bit of both? Well, there’s your assignment, and I know you can handle it. It’s why, after all, you make the big money. ← Crime Reporting, Part 2: What’s the Story?